Spend 3 days in the picturesque hills of Nainital and rediscover the little delights of nature - the twinkling night sky, the crackling bonfire and the rustling forests. You can spend the your days going on short hikes to nearby view points and waterfalls, participate in adventure activities like Commando Net, or drive down to the town of Nainital, located just 50 kms away. You can also spend quality time at the campsite over games of badminton, chess or carrom. At night, huddle around a bonfire before drifting into sleep inside your luxury Swiss tents. NOTE: A minimum of 2 travellers are required to book this trip. Located at 2-hr drive from Nainital, your campsite is located in the small town of Mukteshwar. Set up on a mountain slopes with terraced farms of apples and peaches, the campsite is close to several vantage points that look over valleys populated with sprawling forests and peaks towering in the sky. The rustic clusters of villages only add to the charm of a hill town. 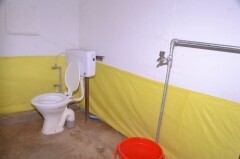 You’ll be staying in luxury Swiss tents with attached washrooms. 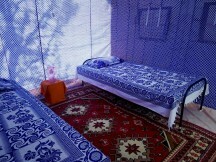 Inside your tent, you’ll have comfortable beds, blankets, bedsheets and pillows. A kitchen at the campsite will serve fresh cuisine for meals. • Go camping near Nainital and escape the busy city life. • Spend two nights in luxury tents. • Go on short hikes in the Kumaon hills around the campsite. • Spend quality time with your family or friends in the midst of nature. • Gather around a bonfire at night to the sound of music. Camping near Nainital is a non-strenuous activity. However, if you have any cardiac or respiratory conditions, or suffer from knee or spinal problems, please consult your doctor before booking this trip. Travellers are required to adhere to instructions of the tour guide while undertaking any adventure activity during the camping trip near Nainital. Consumption of drugs is strictly prohibited during the camping trip near Nainital. For cancellations made more than 15 days before check-in date of the Nainital camping trip: 100% refund. For cancellations made 15-6 days before check-in date of the Nainital camping trip: 50% refund. For cancellations made 7-2 days before check-in date of the Nainital camping trip: 25% refund. For cancellations made less than 2 days before check-in date of the Nainital camping trip: No refund. Accommodation for children younger than 5 years old is not charged, without an extra bed. 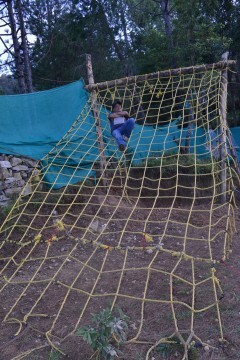 Accommodation for children aged between 6-12 years is charged at a discounted price of INR 3,500. Accommodation for children aged 13 years or older is charged at full price. The tour operator takes utmost care to ensure safety of the travellers and shall not be held responsible for any mishap or accident while camping near Nainital. There is no pick-up for this camping trip near Nainital. There is no drop-off for this camping trip near Nainital. Arrive at your campsite by 12:00 hrs and check-in to your luxury Swiss tents. You can spend the rest of the day at leisure. Take a walk and explore the natural delights of the campsite, or participate in rope course adventure activities like Commando Net. You can also go on short hikes to nearby view points or waterfalls, or drive down to visit the town of Nainital, located 50 kms away. At the campsite, you can challenge your friends or family to a game of badminton or spend some quality time over chess or carrom. At night, you'll gather around a crackling bonfire and relish on snacks before calling it a day. 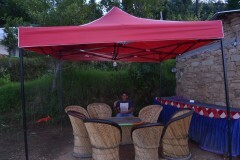 Overnight at Mukteshwar campsite in tents. Day 2 of camping near Nainital: Relax and enjoy! Wake up to misty morning views of the Kumaon mountains. You can spend the rest of the day at leisure. Take a walk and explore the natural delights of the campsite, or participate in rope course adventure activities like Commando Net. You can also go on short hikes to nearby view points or waterfalls, or drive down to visit the town of Nainital, located 50 kms away. Bid goodbye to the scenic campsite and check-out by 11:00 hrs. Your trip ends here. Any costs arising from unforeseen circumstances such as bad weather, road blocks etc. 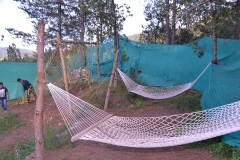 Overnight at Mukteshwar campsite in tents. Check-in time at the campsite is 12:00 hrs. 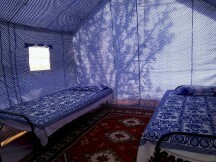 You'll be accommodated in luxury Swiss tents with attached washroom, beds, blankets, pillows and bedsheets. Today's meal package includes lunch and dinner. All meals will be vegetarian and served as a buffet. You'll also be served a non-alcoholic welcome drink upon arrival, as well as evening snacks around the bonfire. Relax and enjoy your time at the campsite. 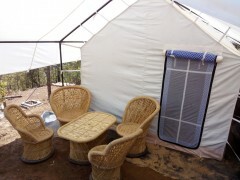 You'll be accommodated in luxury Swiss tents with attached washroom, beds, blankets, pillows and bedsheets. Today's meal package includes breakfast, lunch and dinner. All meals will be vegetarian and served as a buffet. You'll also be served evening snacks around the bonfire. Today's meal package includes breakfast only. Check-out time at the campsite is 11:00 hrs. Depending on availability, you can even extend your stay at the campsite. Your trip ends here. Private sit-out area outside the tents. The campsite is accessible via road with a 3-hr drive from the Kathgodam railway station. You can board a train to the railway station, and rent a car to reach the campsite.